The glee club performed in its first show as part of CBA’s annual jazz concert, singing with the CBA men’s choir and special guests David Benoit and Selena Albright in front of a packed audience at Christian Brothers Academy on December 3. 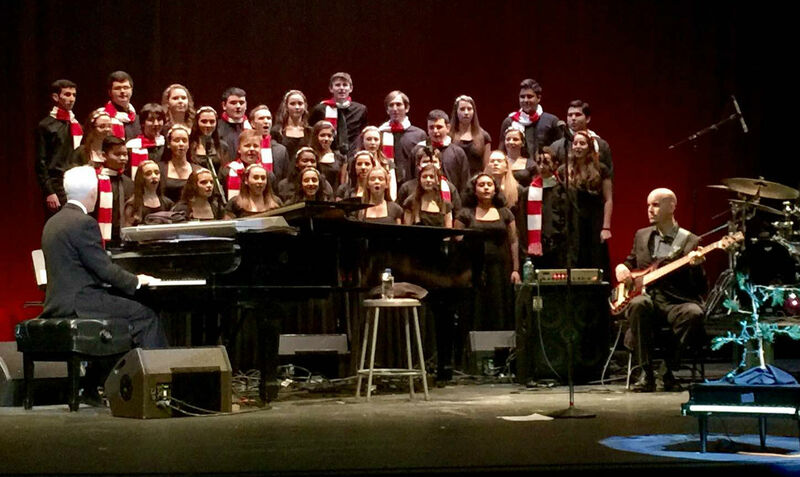 Trinity Hall’s Glee Club and CBA’s Men’s Choir perform at the CBA Jazz Series with David Benoit on Dec 3. Glee club advisor Kali Lambrou agreed that the 21 members of the club devoted much time and energy to preparing for the big night. “Rehearsing was fun and filled with community spirit between Trinity Hall and CBA, and the experience with Mrs. Karen Gold, musical director of CBA, was wonderful…She brought out the best in all the performers,” Lambrou said. While the glee club has performed for the Trinity Hall community before, they recognize the significance of their first live concert performance and hope they can add more like it in the near future. December 21, 2014 in Archives.